ROAD TOWN, Tortola, VI- Opposition Leader and Chairman of the Virgin Islands Party Hon Julian Fraser RA has said it is a shame that after so many developments that the territory has experienced and the training of many professionals over the years, locals are being side-lined for top posts in the territory. “What's wrong with this picture? Even after trading the mule for the bile 60 years ago; traded the typewriter for the computer 30 years ago; then 10 years ago we ditched the rotary phone for the smart phone, trained numerous amount of lawyers and doctors....and where the hell are we? The Leader of this Territory has to take the stand, that enough is enough, and no longer can the BVI be viewed from outside as fair game. 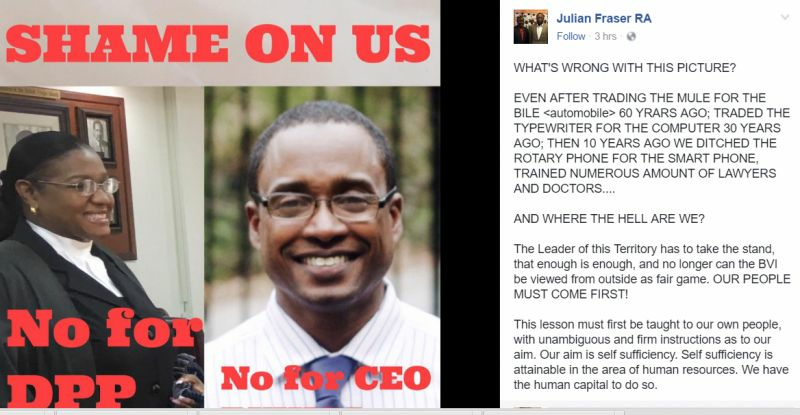 OUR PEOPLE MUST COME FIRST!” Hon Fraser today, September 7, 2016 wrote on his Facebook wall alongside a photo of Virgin Islanders Tiffany R. Scatliffe-Esprit who was recently overlooked for the Director of Public Prosecutions and Dr Ronald E. Georges who was also recently snubbed for the post of CEO of the BVI Health Services Authority (BVIHSA). Hon Fraser then echoed what many have been saying: That all locals need is a chance to prove themselves. He also said our ancestors would not have been impressed to see that the generations have not been progressing as they were expected to. “Imagine, the Georges family which goes back to the 19th century in mercantilism in this territory; owners of huge estates involving multiple tracks of land; and are also known for their generosity as was exhibited by the sale of the 114 acre Nibbs Estate to government for far below market value, solely for development by young people, hearing that even after four generations they can't qualify for a post in the territory. Hon Fraser continued that history will tell that Virgin Islanders as a people are better that they know and that there is little the people can’t do, emphasising that all they need is a chance. “Speaking of families whose name is synonymous with Virgin Islander: "Smith". Google it and it should tell you things like massive estate owners; merchants; shipwrights, yes, remember the Virgin Queen? Oops, forgot, you too young. They built it, they owned it, and they ferried passengers to and from St. Thomas in the 60s early 70s, much the same as the Bomba Charger does it today in that old Smith tradition. Could you imagine the Smiths waking from their graves to learn that even after 3 generations there is a job in these Virgin Islands that they are not qualified to hold. 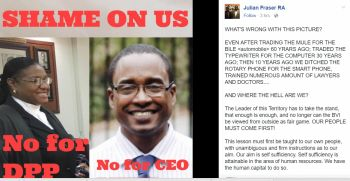 The Opposition Leader shared that he has asked the same question regarding the post of Chief Executive Officer of the British Virgin Islands Health Services Authority. “We have to stress and instill in our people at all levels and in every agency, that growth and development is false, if it does not include our people. A few months ago in June, a referendum in the United Kingdom demonstrated through BREXIT, the effect of leaving your people behind. Today Poland is looking inward for the very reason. As their Minister of Finance puts it, "when Poland decided to privatise its industry/economy, only foreigners had money to buy, and they did. So decisions to change all facets of Polish society are being made in cooperate headquarters outside Poland in countries around the world, to the resentment of Poles.’"
Hon Fraser added that the BREXIT and Poland scenarios are used to illustrate the consequences of failing to empower your own people. “It is not too late, we have time, we just have to focus. This is about us. Our GDP is for all intents and purposes $1 billion, and frankly I don't think it reflects our society,” Hon Fraser wrote. AND WE WANT TO GO INDEPENDENT??????? Tiff gets the chance to prove herself everyday she does to Court - again and again she lets herself down. The idea that she would have been better that the QC who got the job is nonsensical. We can't appoint locals just because we are local. How the Government so silent ??? This man should've been commander in chief. The BVI is a disaster...6th form, NHI, no jobs for locals, no rent from cruise pier, no agriculture, no money, no rent from craft alive, no more petty contracts, no bush cutting, ZIKA and the list goes on and on. Seems that some are not taking personal responsibility for choices made in a place of opportunity. Place of opportunity for SOME. The NDP is the party of/for the outsiders. Fraser boy they can't micro manage the locals but the outsiders operates like Robucs control by our misleaders. All i can do is laugh! The powers that be is keeping "us" Virgin Islanders down. What the leaders tends to forget is that for every Virgin Islander that you keep down you are also keeping back lots of younger Virgin Islanders (food for taught). In my own experience, i'm still waiting for "belonger status" for my wife over 7 months after she has applied. So much for looking out for us Virgin Islanders. It's a da*m shame! Thanks for expressing our deepest concerns. The VIP built the NDP now the NDP broken down its own. The same clyne was given a chance, now he refuse to give his own a chance. What chance was Cline given, personally? When? By Who? Explain. My name should help you. We elect people to look out for our interest. Our jobs must be one of our interest. Let the ballot talk. Keep on disrespecting our people and the pen or pencil will do what we got to do. No, here is the man who them bash for the election saying he;s not for the people and here he is defending even though his back is against the wall. People give the man a chance and see what he can do. We give doctor smith a chance and see what he did with his indians who all want to be chief. We did the VIP wrong thing and now we are paying for it big time and it's gonna get worse if we don't get the NDP out of office next election. The Hill man acted too on many occassions in Immigration, never failed a performance evaluation but is being deliberately discriminated against. Where was Fraser? And the Governor is a joker in this matter. This country will live to regret not voting for fraser and his crew. BVI officials create structures which are unaccountable to anyone, so everyone does as they please from politicians down. No one monitors anything or any institution, so things go astray and never get back on course. Therefore evaluations are feared. When you create unaccountable boards, place persons with no expertise on them for political favours, give them all power and resources without check, and they hire HR Personnel from everywhere but here, how can you wonder when those HR managers import their friends and relatives from overseas, and jimmy the system so that the ignorant boards are maneuvered into hiring the espoused best candidate recommended by HR Managers? The problems of the BVI are easy to solve. Teach ethics, monitor systems, mentor workers, evaluate systems, make appropriate corrections. Show respect for self and others. That's what leaders do. Of course BVI leadership is taking a big hit right now because we are skilled liars to ourselves and to others who allow the lies to stand while pretending that truth is of no importance in BVI life. The absence of truth is the environment of evil. And sadly, evil of all forms proliferates in the BVI. Tourism Board deputy director next. Eyes open. sometimes we have to say one and say two at the same time. I am all for fighting for our own. but when we did get our desires we came out against them. look how we reacted to the new president of the college... there we finally got a local and we dissed her. one must wonder if we're really prepared to have locals in positions or is it just a talking piece. here is a thought: can we send a person like guy hill away for training and have him come back and run the prison or police system. same for someone like Dr. Georges. the list can go onn. what are your thoughts? Great Let's send Guy to learn Health Services Management and Georges to learn Immigration. This is in response to "Say What". Dr. Georges was there before. Those who were on the interviewing panel must be aware of his limitations. We now have the new Hospital. In the Healthcare Industry, accreditation is crucial. If he does not have the experience and have never taken an Institution through that process, why should he be selected above someone who has the experience. I believe that the Board Members want to ensure that during their tenure they could leave a legacy of at least having the Hospital accredited. I believe that we should try and get out of the politics and think country. Health is nothing one should politicize. At the end of the Hospital being accredited, one would start seeing the benefits and the contribution that the expat would have made to our country. I am sure that she would not be taking the Hospital with her at the end of her contract. The benefits would be left for us all and it would be easier for a local to then manage the Authority.